Lust, greed, violence, the frenzy of the ad biz, the evils of the drug trade, the vagaries of the Information Age, the CIA, the Super Bowl, the kitchen sink—and still the suspense just won’t wash. Why? Because what the husband-and-wife team (he: Double Cross, not reviewed) left out here is what matters most, the sine qua non required for any page-turner: sympathetic characters. Meet Marty English, as derivative a protagonist as ever there was. A hotshot ad exec, he’s bucking to be president of Wynn Bergman, mega-agency. Though he’s —English— now, he was —Inglesia—at birth’son of the one and only Tony Inglesia, Chicago’s loftiest mafia don. 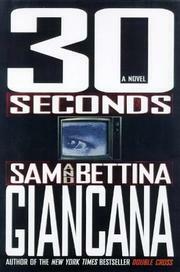 (Incidentally, author Sam Giancana is namesake and nephew to the mob figure by the same name.) Early on, Marty wins the gigantic Isaac Arrow account. The bad news is, victories don’t come more Pyrrhic. To begin with, it’s all a sham: Isaac Arrow, the much- respected multinational pharmaceutical company, is actually a front for a mushrooming drug operation. But Marty, bemused by Arrow’s straight-arrow rep, is at first mostly concerned with the complex 30-second commercial he has to get produced. His new client demands that it appear during the Super Bowl, which happens to be three weeks away and booked solid. Before Marty can get completely caught up in this travail, however, his revered father is murdered. (Never mind those mafia peccadilloes——He had honor.—) Set in motion, then, is a chain reaction that ends with Marty battling to save not only his life but the world from a drug even more pernicious than heroin or cocaine. So here it is Super Bowl Sunday, and there’s Marty English ranged against more forces of darkness than you’d readily believe. Let’s just say that few ad men ever had to fight harder to keep the cookie from crumbling. Tons of surefire thriller elements; not a spark of life.